Admirals Inn Classic Slot Guide & Review - Casino Answers! 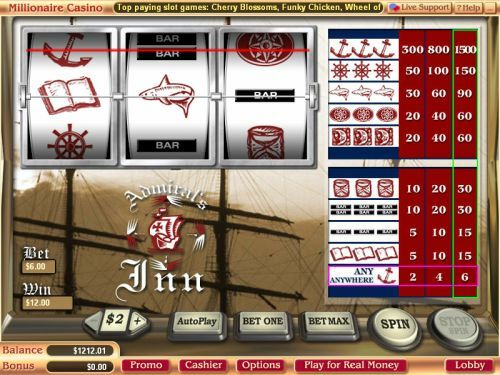 Admiral’s Inn is a 3-reel, 1-line classic slot machine developed by Vegas Technology. You can play the Admiral’s Inn classic slot machine at Bovada. Coin values on the Admiral’s Inn slot machine are $2, $5, $10 and $25. You can bet 1-3 coins per spin. The lowest total bet you can make on the Admiral’s Inn classic slot machine is $2 per spin with the highest total bet possible bet being $75 per spin. Admiral’s Inn is a high roller slot, with a betting range more suited towards high rollers than casual players. You can manually skill stop the reels at any time during a spin by using the “Stop Spin” button. To play the Admiral’s Inn slot machine, hit the “Bet Max” button to play the 3-coin maximum bet or select your bet and hit the “Spin” button. The highest paying symbol on the Admiral’s Inn online slot machine is the Anchor symbol. On a 3-coin maximum bet, you will win the 1500 coin top jackpot. If you bet less than 3 coins, you will receive much lower winnings. You can win lots of cash by hitting this winning combination when you play Admiral’s Inn at Bovada. There are 10 winning combinations on the Admiral’s Inn classic slot machine. The complete payout schedule is as follows (1/2/3 coin payouts in parenthesis): 1 Anchor symbol anywhere on the reels (2/4/6), 3 Ship’s Log symbols (5/10/15), 3 Single Bar symbols (5/10/15), 3 Double Bar symbols (10/20/30), 3 Hourglass symbols (10/20/30), 3 Moon symbols (20/40/60), 3 Compass symbols (20/40/60), 3 Shark symbols (30/60/90), 3 Wheel symbols (50/100/150) and 3 Anchor symbols (300/800/1500). Press the “AutoPlay” button to access the Admiral’s Inn autoplay mode. You can select the number of spins (5, 10, 25, 50, 100, 250 or 500) and number of seconds between spins (0, 0.25, 0.50, 1, 1.50 and 2). You can also set stop settings including to stop once all spins are complete, stop when jackpot is won, stop if a win exceeds or equals ($50, $100, $150, $200 or $250), stop on any win and stop if credits increase/decrease by ($50, $100, $150, $200 or $250). You can stop autoplay on Admiral’s Inn at any time. Admiral’s Inn is a relatively standard high roller slot machine. There are no special features, including wild symbols or multipliers or anything of that nature to be found. To play Admiral’s Inn, you can sign up and make a deposit at Bovada. Can players from the United States play the Admiral’s Inn slot game? Yes, American players are welcome to play the Admiral’s Inn slot machine at Bovada.